Do you want the look of upscale stone or wood in your home, but don’t want the expense? Consider installing our luxury vinyl flooring for an expensive look that is affordable and cost effective. Our showroom offers a wide selection of luxury vinyl products that give you the look and texture of hardwood or traditional tile. 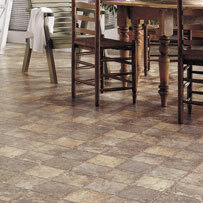 Today’s vinyl flooring is stylish, extremely durable, and surprisingly affordable. Our showroom is staffed with flooring design experts who are ready to help you choose the style that fits your decorating plan. They are specialists who are able to guide you to the product that perfectly meets your needs in price, performance, and appearance. Come to us to find exceptional customer service and unrivaled selections of luxury vinyl floor tile and luxury vinyl plank flooring. Visit us today and take a look at our impressive selection of vinyl tile. Whether you are looking to add new floors to your bathroom, living room, or even your entire house, we have all of the materials to suit your needs. The best thing about this flooring type is the fact that there is no limit to its applications. If you want to have the look of wood floors in your bathroom or the style of stone throughout your house, nothing is stopping you. The only limit is your imagination. When you have a busy, active family, you need a floor that does more than just look good. You need a floor that stands up to the heavy use of everyday life. Our vinyl flooring is durable and resilient. It withstands heavy foot traffic and spills without suffering scratches or dents. This flooring is virtually waterproof, so you don’t have to worry about moisture damage. With our resilient flooring, you are able to relax, knowing that it is tough enough to handle even the busiest household use. Cleanup is a cinch. A quick mop or vacuum is all that is needed to keep your LVT looking neat and clean. Because it is a flat, solid surface, you don’t need to worry about pet hair or dust being absorbed into your floor which means that this flooring is responsible for reducing the allergens in your home. When you choose our vinyl tile, you choose resilient flooring that is easy to clean and maintain -- it’s a smart choice. Because of an innovative vinyl floor manufacturing process, these floors can be made to closely resemble many different flooring products in both appearance and texture. Today’s vinyl flooring is able to give the illusion of hardwood, ceramic tile, or natural stone tile, but at a fraction of the cost. The wide array of options available in luxury vinyl flooring makes it easy to create a sophisticated and stylish look for your home. The secret to vinyl’s amazingly realistic appearance lies in the use of special 3D imaging technology. The manufacturers who design this flooring often use these special cameras to take detailed images of the real counterparts they hope to represent. The reason vinyl looks and feels like real wood, tile, and stone is because it is a nearly perfect copy of the real thing in texture, color, and appearance. It’s not a trick of the eyes, vinyl looks and feels like the real thing. Vinyl plank flooring is a popular alternative to hardwood floors. Because of the advanced embossing process used to make this flooring, you will find it extremely realistic, with grain, lines, and knots that look like the real thing. Luxury vinyl planks give your home the same warm and comfortable feeling that you get from hardwood. Our wide selection of luxury vinyl flooring makes it easy for you to match almost any wood species or grain. While hardwood is a beautiful and luxurious flooring choice, it doesn’t work as well in rooms or areas that expand with changes in moisture and temperature, so it isn’t ideal for every room of your home. You are able to avoid that concern with our vinyl planks. It’s a perfect choice for kitchens, bathrooms, and basements because it isn’t affected by moisture and temperature changes. Luxury vinyl plank flooring is able to give you the appeal of hardwood with the durability, flexibility, and affordability of vinyl. The naturally durable nature of vinyl and its waterproof qualities makes it the perfect choice for homes with pets. While hardwood is a great choice for many homeowners and unrivaled in elegant style, it tends to get scratched up over time as your furry little friends walk, run, and play. There is also a concern about spills, scratches, and dents that may damage the wood. With the help of vinyl plank flooring you get the look you love without the fear of it being damaged by the activities of daily life. No matter how good your flooring is, it is always limited by the quality of its installation. Even lesser quality flooring is able to look great if installed right, but the best flooring isn’t able to save a haphazard installation. When you choose to take advantage of our services though, you never have to worry about an inadequate luxury vinyl tile installation. Our team of experts is here to help you every step of the way. Let us install your new vinyl floor for you. Our professional, experienced installers will make sure that your new floor is installed properly and efficiently. You can be confident that your luxury vinyl tile installation will be completed with meticulous care by knowledgeable experts. We feel so confident in our installation process that if you have an installation related problem, we will make it right at our expense. It is that level of customer service that keeps our customers coming back year after year. Let us make your remodeling dreams come true. Contact us today for affordable luxury vinyl tile flooring. We serve Vernon, South Windsor, Ellington, Tolland, and Manchester, Connecticut, as well as the surrounding communities.